This mystery appears to be looking right back at you. What is it? 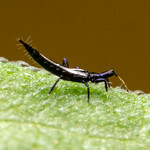 All ten Myrmecos points go to the first person to correctly name the genus of animal pictured above. 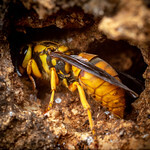 The cumulative points winner for the month of September will win their choice of 1) any 8×10-sized print from my insect photography galleries, or 2) a guest post here on Myrmecos. Alex, next Monday just throw the bouquet of points into the air for someone to catch. I felt bad that last week’s mystery was hard enough to take several hours. Before posting my guess, I made the mistake of hitting the refresh button to see if anyone had posted. No one had. And in the time it took me to scroll down, right click, hit paste and tap enter, Bill posted his guess. So easy Alex even I would have gotten this one. Please be be generous to these folks, even if they think it’s easy. Can we have an Australian Camponotus for the quiz next week? Just noticed that according to GAP’s LUCID key all Camponotus are polymorphic? I figure that since you’re in Belize, it has to be something from there. So my guess is Morpho menelaus. Caligo, an oddity in the Nymphalidae – the only known eye-spotted species that does _not_ express the Distal-less gene in the developing eyespot.